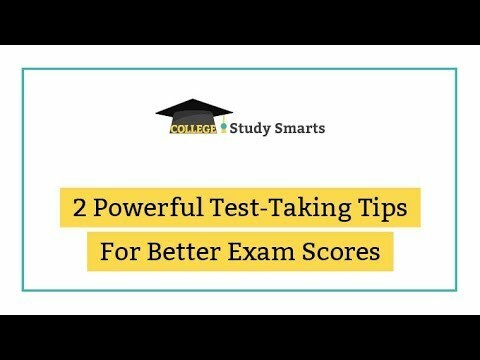 If you have ever felt the disconnect between your study efforts and grades on an exam, these two powerful test-taking tips may be the key to reconciling those two variables. Our study efforts and sadly, or understanding and mastery of the course material, don’t guarantee success on exams. There is a lot of strategy in how we approach taking tests which affect the final outcome. The biggest shift I have seen in my own exam scores comes from applying what modern psychology has learned about confirmation bias. This natural tendency of the brain can have a major impact on how we perform on tests and exams. Remember how important our mental process is to succeed in college and learn how to crush exam fear. How does Confirmation Bias affect test-taking tips? This has huge implications for how we take exams. Are we choosing answers because they are factually correct or because we see evidence pointing to what we believe is the right answer? It may sound like an odd question but stick with me because it has big implications. How we think through test answers has a major impact on how we choose the correct answer and our performance on the exam. You may be approaching questions in a way which leads to lower scores that don’t reflect your understanding of the material. The good news is with a small tweak in the approach we can hack our brain’s natural tendencies and see improved exam scores. Try out the powerful test-taking tips below. When we take tests there is an inner dialogue going through our minds. You may not be conscious of it, it’s there, but we all talk or coach ourselves through the questions and answers leading to a final decision. Step one is to pay attention to this inner dialogue. You are already doing this and knowing how you do it is a powerful starting place. Then, try these two test-taking tips to tweak how you coach yourself to see improvement in your performance. It may take some practice to coach yourself in a new way, but it is worth it. When taking an exam the goal is to choose the correct answer to every question. Obviously. The natural approach is to approach each question with the goal of spotting the correct answer. We look at option A and think…”Is this correct”. Then we move to the next option with the same question, etc, etc. The problem with this approach is because of confirmation bias we will look to interpret each answer to prove our hypothesis right. And with this strategy, our hypothesis is the answer is probably correct. I’m looking for the right answer…this might be it…let me prove that it is correct. Do you see how this can go wrong? We are wired to give more weight to the evidence proving the answer correct and less weight to the evidence proving the answer incorrect. Flip your approach and look at the first answer with the hypothesis of it is wrong. Then look for evidence to prove it is wrong. The good news is your brain still wants to prove your hypothesis correct. And proving yourself correct means helping you think of evidence for why the answer is incorrect. Then move to the next option with the same approach. At the end of the process, there will be one answer you can’t disprove, meaning it is correct by process of elimination. Check your inner dialogue and see if you are actively looking to prove or disprove each multiple choice test answer. If you aren’t working to disprove each one, try it on your next practice exam and see how your scores change from this very small test-taking tweak. By using the strategy above you will see a big improvement in your scores. But it is worth mentioning where we tend to take this strategy to the extreme: during final review. There are items in any exam we don’t feel 100% confident of and we make a note, or flag those to come back and review. Final review is a great strategy. Often there will be other questions during the exam to help us interpret and answer these items differently. But here’s the challenge: we don’t feel confident about our answers so the final review often has the unconscious hypothesis we were wrong. And when we review our answers thinking we are wrong…guess what? We will emphasize evidence of it. We will find ways to agree that we are wrong and change our answers accordingly. To make your final review effective you need a new hypothesis to serve you better. I like to go back looking for new details. What did I miss the first time? What did I see in another question during the exam, or what fact did I think about differently? My focus stays on new information. I don’t want to prove I was right or wrong, I want to look for a new way to interpret the question. And I only change my answer when I am confident there is new information leading to a different answer. Get specific about it. What specifically has changed in my understanding/recall/interpretation of the material making my previous answer wrong AND another option right? These two powerful test-taking tips are subtle shifts in how we approach multiple choice exams. But don’t let their simpleness deceive you. They can completely change the results you get on exams. And if you study hard, practice and apply these tips, and still aren’t successful, remember failure only exists in your mind. Not passing an exam never makes us a failure. We learn from it, change our approach, and come out better on the next attempt. When you take your next practice exam, pay attention to your inner dialogue. How are you coaching yourself through each answer? Try approaching each question trying to prove the answers wrong. Look for evidence of why each one isn’t correct. Perform your final review with the goal of finding new information, not deciding if you were right or wrong in your answers.